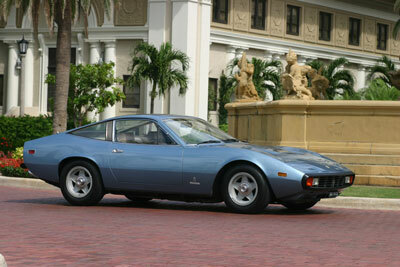 You've found the site dedicated strictly to the 1971-1973 Ferrari 365 GTC/4. 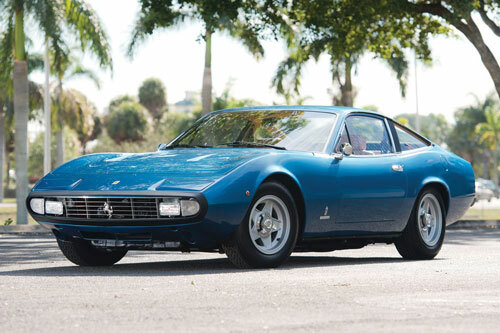 Considering purchasing one of the 500 Ferrari 365 GTC/4s in the world? Do your homework first. 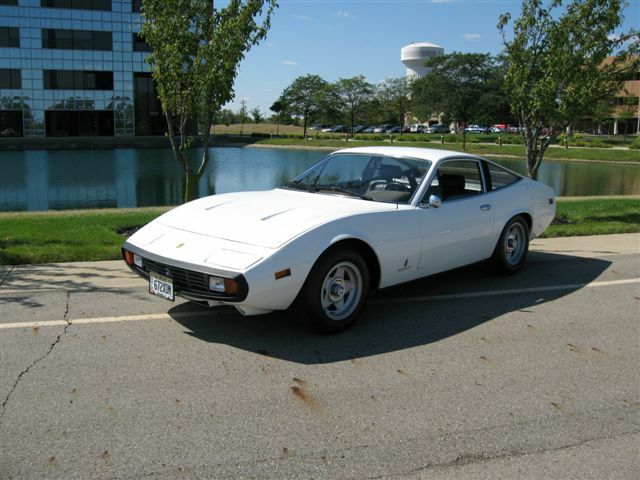 Our online forum is the place where owners post questions and answers about everything having to do with these wonderful cars. The origin story, interior and exterior design details, as well as all the paint and leather colors. 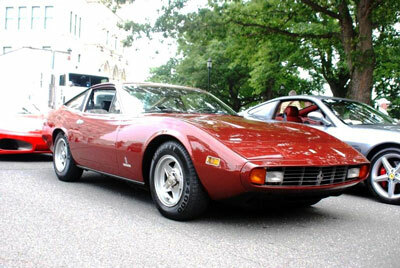 Specifications and details on Engine, Transmission, Differential, Chassis, and Suspension. Buyers Guides, common problems, and modification info to read before you purchase. Ferrari in the media, Factory Technical Bulletins, original manuals, tool kits info, and other useful publications. 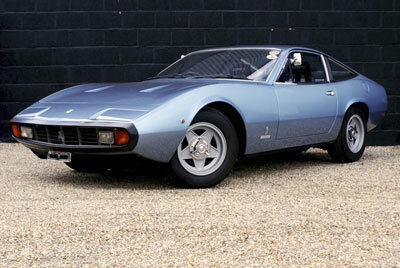 Ferrari debuted the 365 GTC/4 model at the Geneva Motor Show in March, 1971. Although the car sports two small rear "seats", it wasn't designed as a replacement for the longer 4-seat 365 GT2+2, instead it was Ferrari's newest civilized and practical 2-seat coupe, similar to the previous 330 GTC and 365 GTC models. 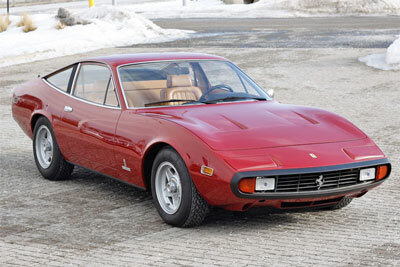 Keeping with Ferrari's engine-centric naming scheme of the time, the 365 referenced the displacement (in cubic centimeters) of a single cylinder while the GTC meant it was a Grand Touring (road) car in Coupe (2 door hardtop) configuration and the 4 bragged of the newer 4 camshaft cylinder heads. 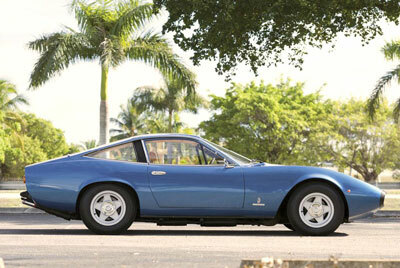 Introduced in 1969 and designed by Aldo Brovarone at Pininfarina, the 365 GT 2+2 preceeded the 365 GTC/4. 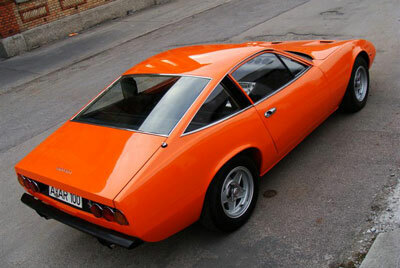 800 were produced. 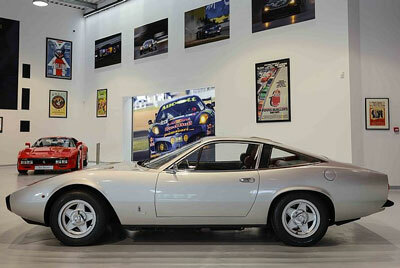 365 GT 2+2 s/n 12125 pictured. 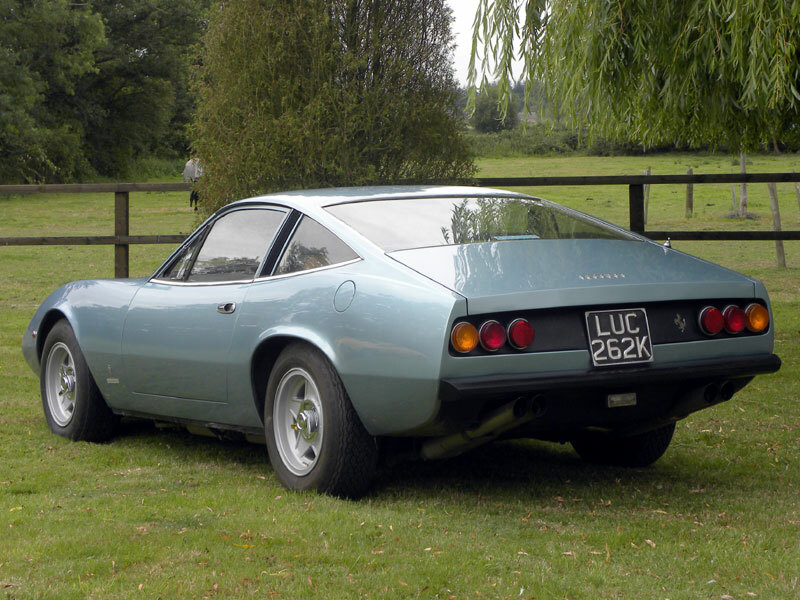 With a short run of only 500 units and a shorter wheelbase than the 2+2s before and after, the 365 GTC/4 was more modern and angular without being boxy. 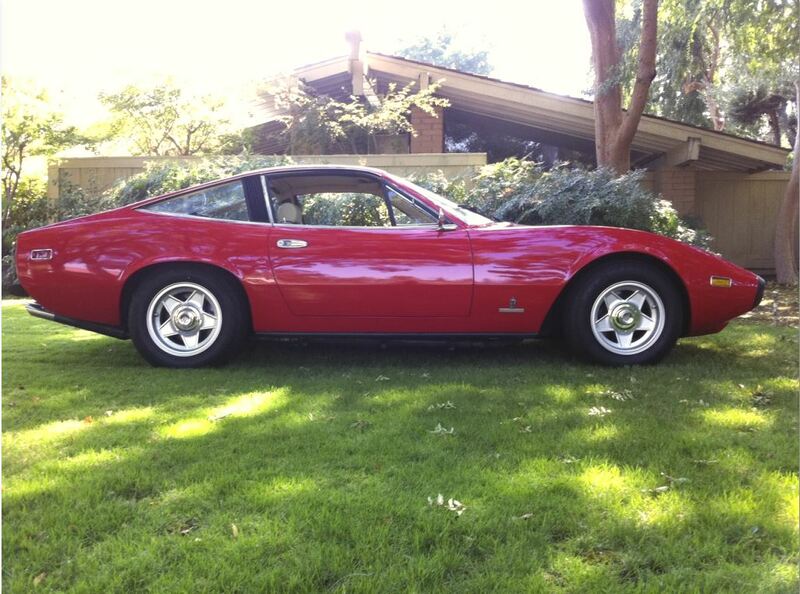 365 GTC/4 s/n 15859 pictured. Introduced in late 1972 and designed by Leonardo Fioravanti of Pininfarina, the 365 GT4 2+2 replaced the 365 GTC/4. 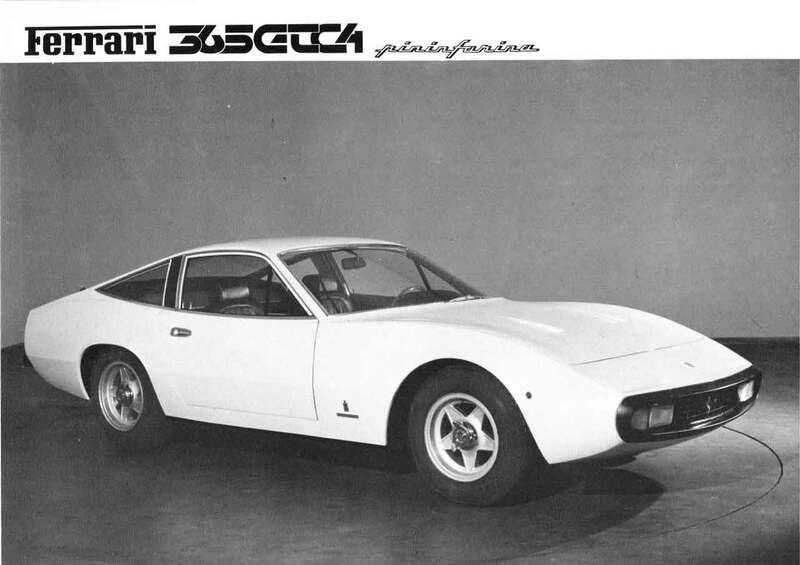 2,907 were produced. 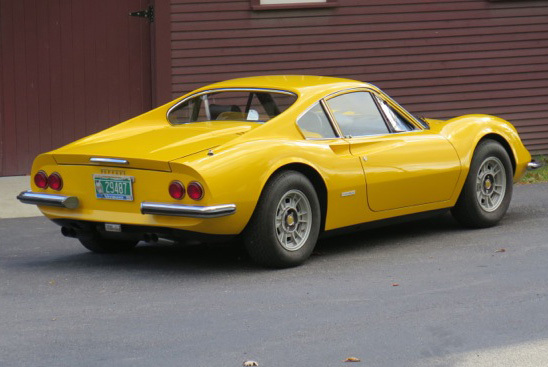 365 GT4 2+2 s/n 22134 pictured. 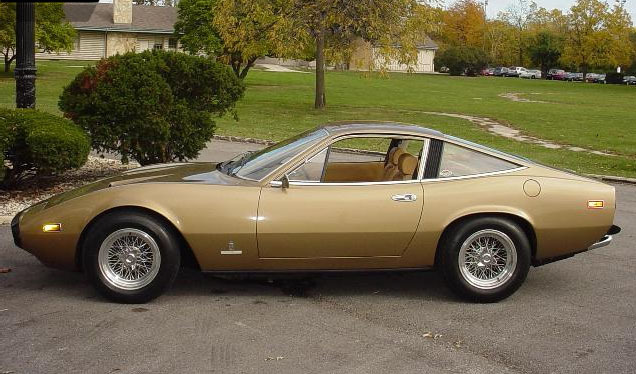 Mechanically, the 365 GTC/4 is closely related to the 365 GTB/4 "Daytona" but it presented its own innovations, including power assisted steering, a large trunk, and side draft carburetors which allow a lower hood line. 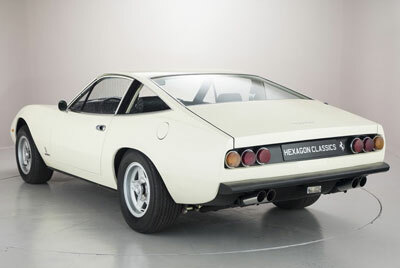 As Road and Track said in its July 1972 review of the car: "In all, a graceful, clean and understated design with subtleties one discovers only by looking it over carefully. 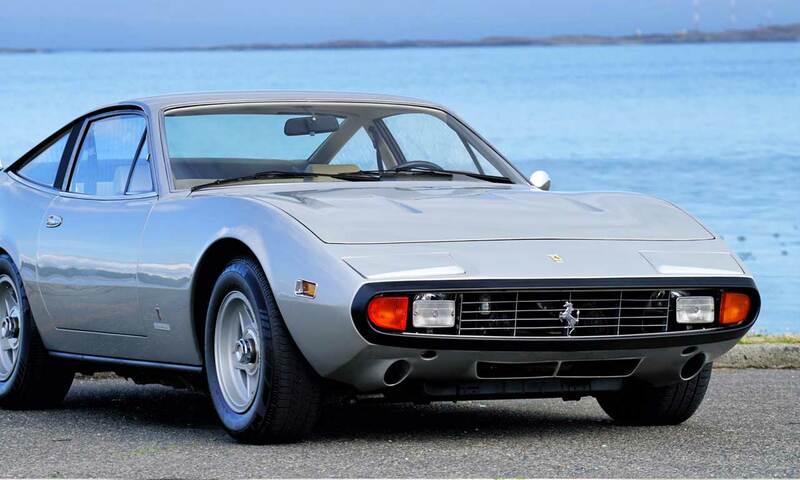 One might say this model is a Ferrari for the mature enthusiast." 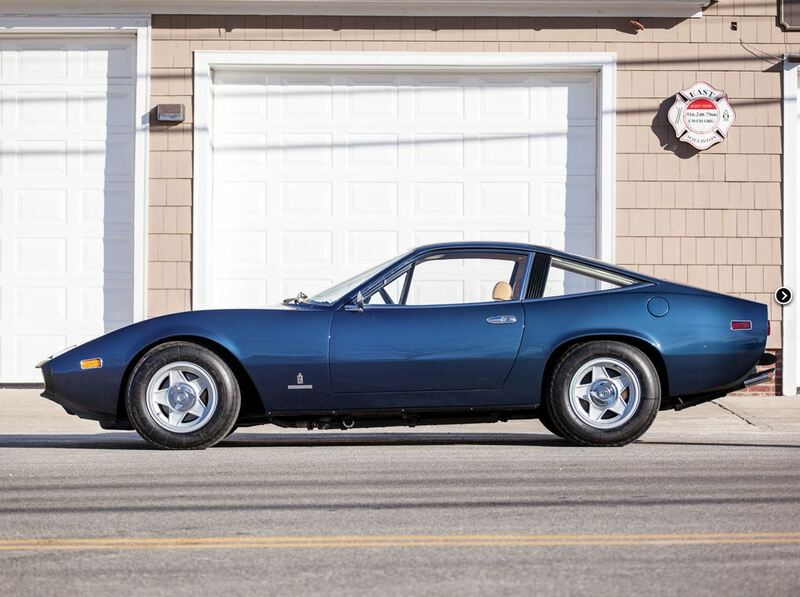 Or, Winston Goodfellow was quoted in the Forza 365 GTC/4 Buyer's Guide as saying: "The styling is so elegantly low-key that the model is often overlooked." 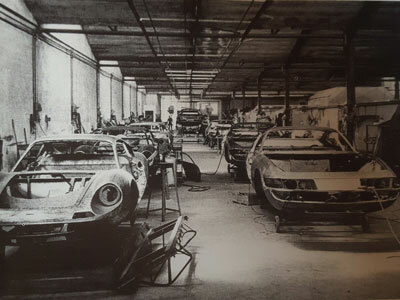 Production started in late 1971 and ran for 500 units through the beginning of 1973 on the same assembly line as the 365 GTB/4 and parallel to the line producing the 246 GT Dino. 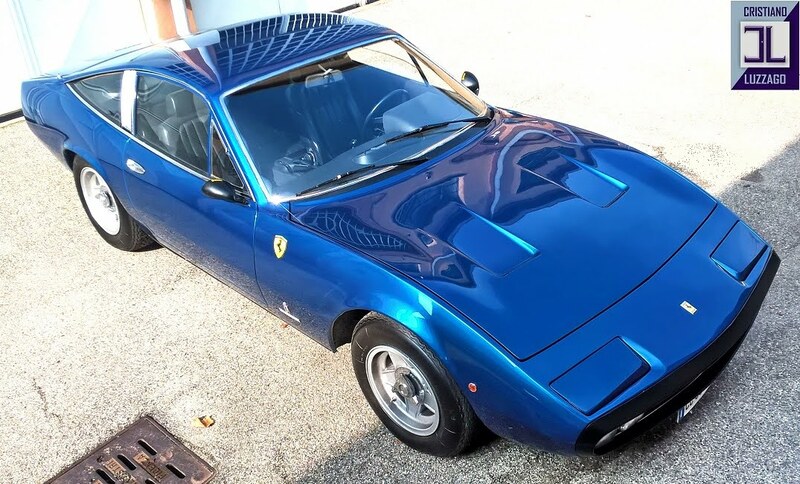 Excluding the prototype (s/n 13741), GTC/4 serial numbers range from 14277 to 16349. 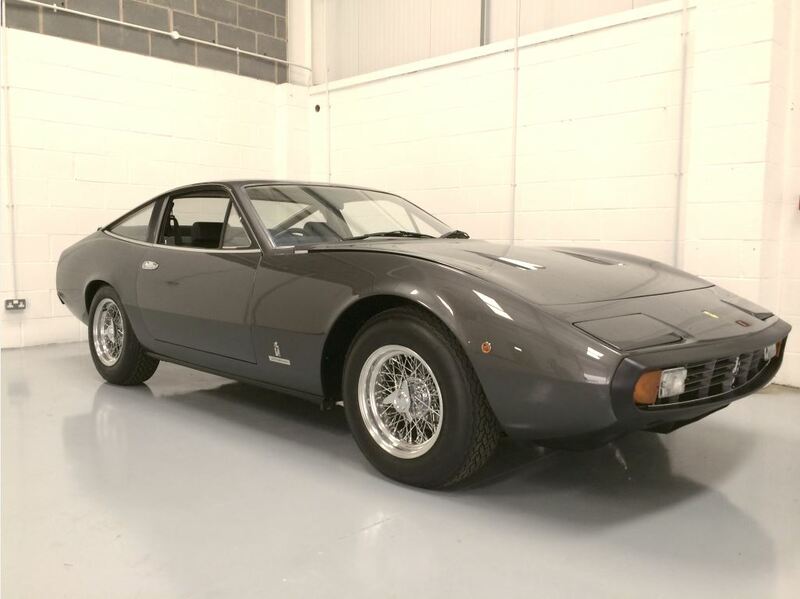 As with all Enzo-era Ferrari road cars, the serial numbers end in an odd integer and Daytona and Dino models of the era also fall within that range. 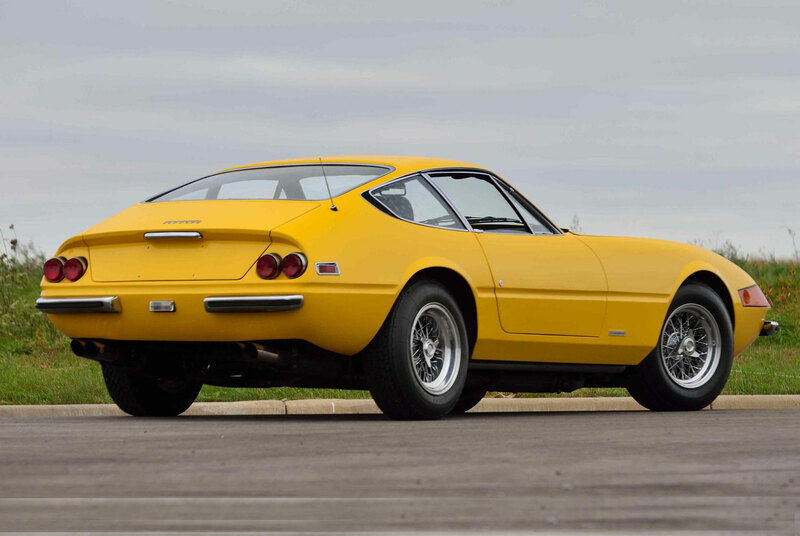 3,761 Dinos were produced from 1969-1974, along with 1,406 Daytonas, making the GTC/4 three times as rare and only half the price of a Daytona today. 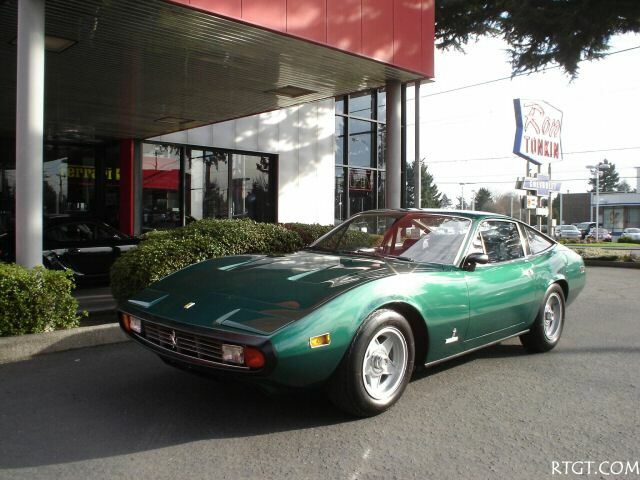 (In 1972 the GTC/4 was $3,000 more expensive than the GTB/4). 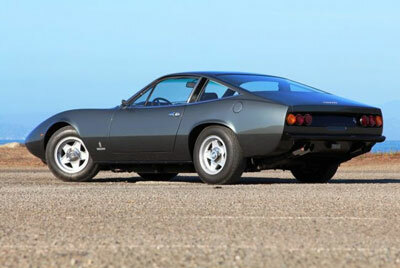 The 365 GTC/4's body lines were drawn by Filippo Sapino at Carrozzeria Pininfarina in the first half of 1970. 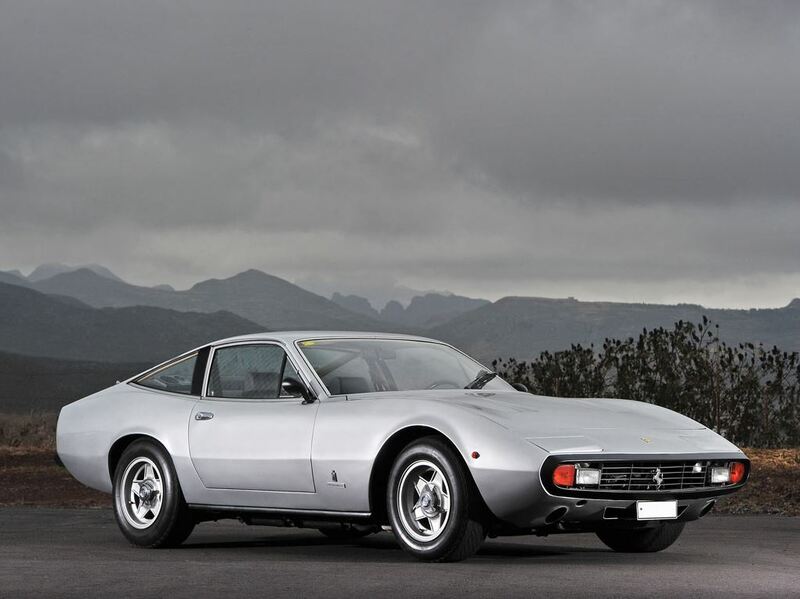 By September, a prototype was ripping up and down the hills around Modena yet Ferrari did not mention the car in their December, 1970 press conference and there was surprisingly little fanfare prior to the 365 GTC/4's introduction as a replacement for the 365 GTC. 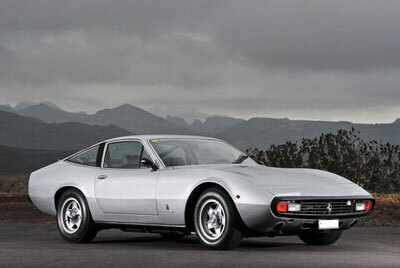 Ferrari built their first assembly line in 1958 to produce the 250 GT models and in 1960 they added a second line. 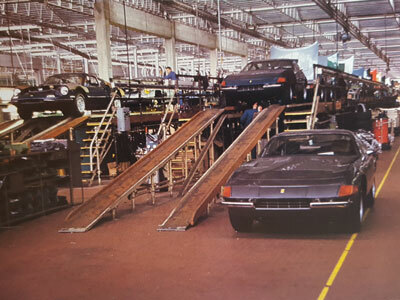 In 1972 the line at left was used exclusively to build 264 GT Dinos while the line at the right produced a mix of V-12 engined 365 GTB/4 and 365 GTC/4 models. 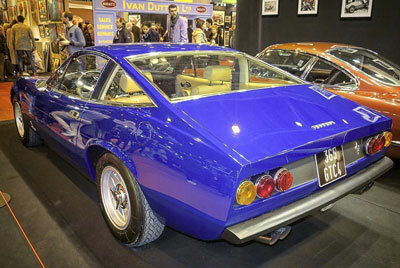 Shown here are a long line of 365 GTC/4s with their hoods up behind the sole blue 365 GTB/4 at the front of the line. 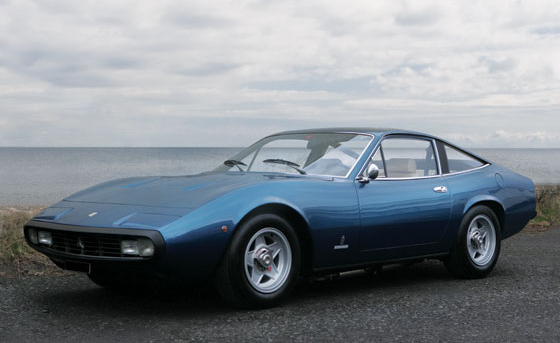 Unlike Daytona and Dino bodies, which were designed by Pininfarina but built by Carrozzeria Scaglietti (shown here circa 1969), the 365 GTC/4 bodies were both designed and built at Pininfarina. Unfortunately, no photo of the Pininfarina production line from 1972 could be located. 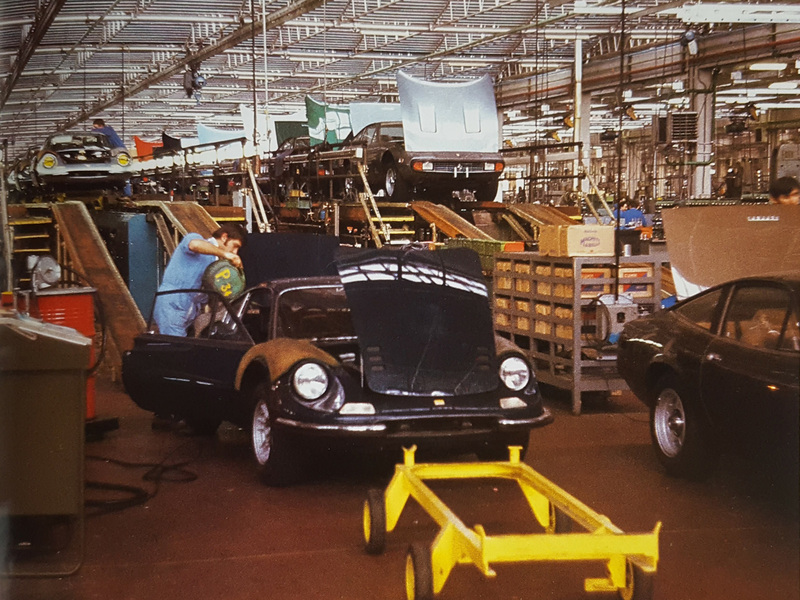 Another view of the twin assembly lines at Ferrari in 1972, showing a 246 GT and a 365 GTC/4 receiving final work before road testing. 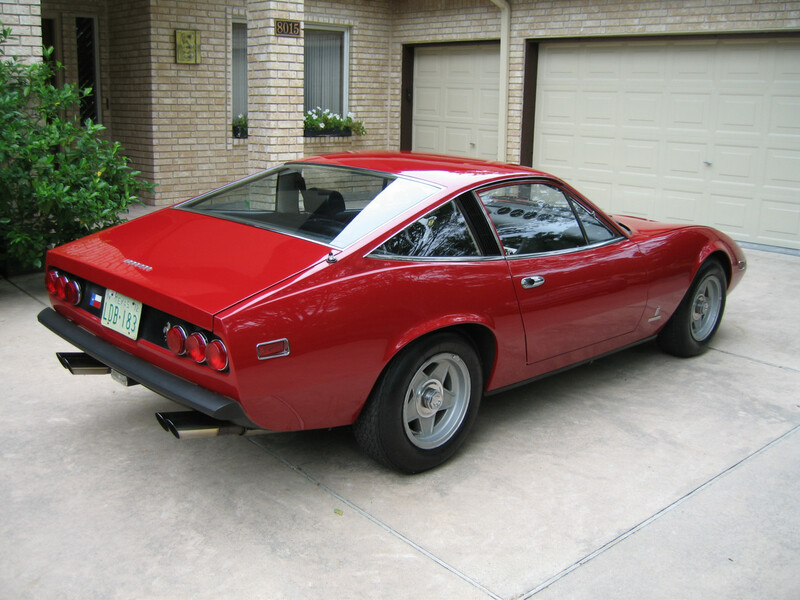 Note how few were painted "resale red". 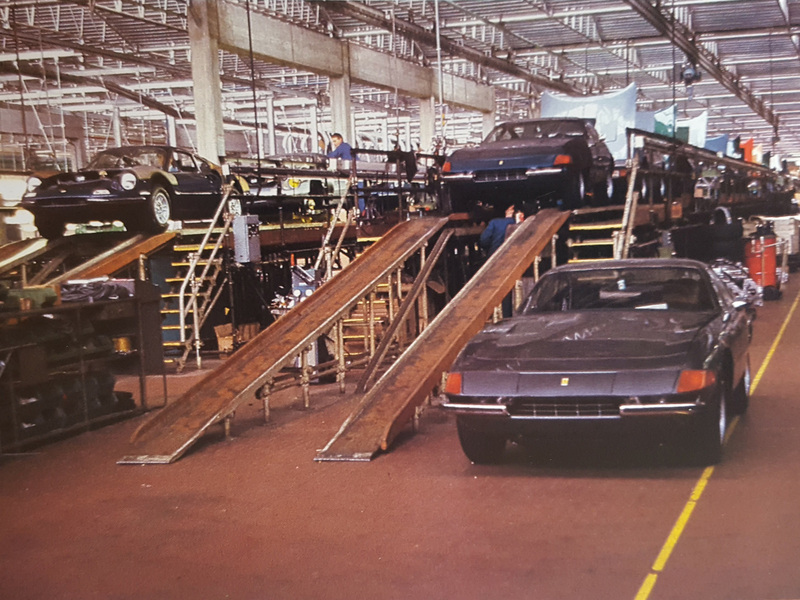 Cars were moved down the line manually by the workers. Henry Ford would be appalled -- these cars were largely hand built. 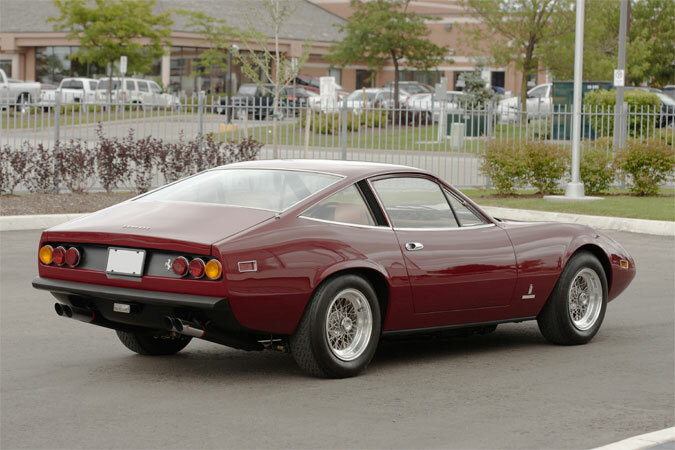 The bodywork was not only designed by Pininfarina in Turin but, unlike the Daytona that had its bodies constructed by Scaglietti in Modena, GTC/4 bodies were also built by Pininfarina and then shipped to Maranello for completion. 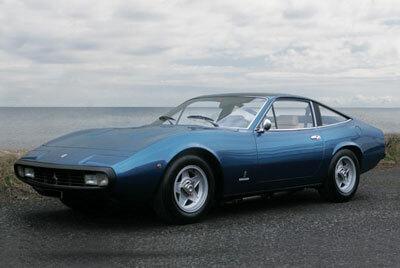 It is widely accepted that Pininfarina built their bodies to a much higher quality standard than Scaglietti. 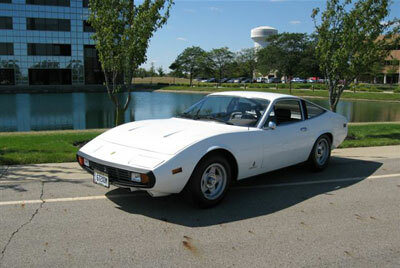 Thus, when comparing a 365 GTC/4 to a 365 GTB/4 of similar age and use, the 365 GTC/4 generally shows less age and wear. The 365 GTC/4 body is finished from steel with fiberglass floor pan, footwells, and firewall bonded to the chassis and an aluminum hood -- all of which resist corrosion. 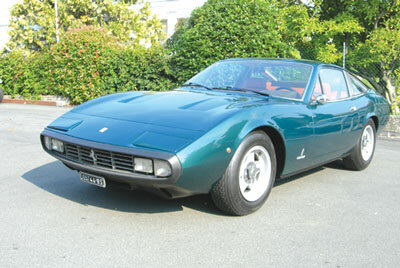 Some critized the styling, questioning its apparently "un-Ferrari-like" simple appearance. 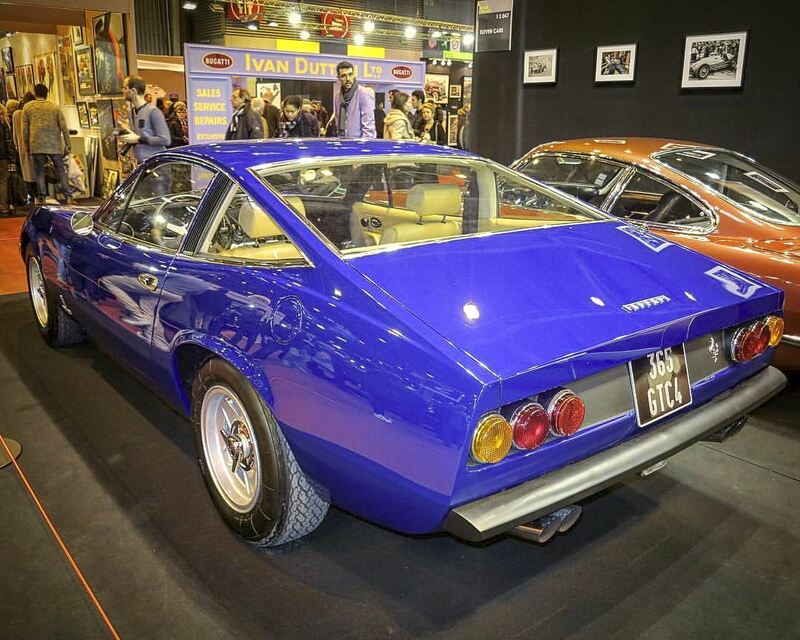 In fact, the Italians nicknamed the 365 GTC/4 "Il Gobbone", or "the humpback" but the body lines have proven themselves graceful and timeless, as so many fine Pininfarina styles do. 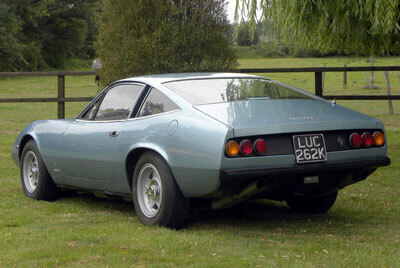 The main body line is very dominant, an unbroken graceful "S" curve which begins at the low frontal air intake, curving up over the front wheel wells, dipping slightly at the line of the cowl to end in a bold upward sweep along the lower edge of the rear quarter windows where it meets the line which extends the roof in another unbroken plane through the rear window and deck lid. 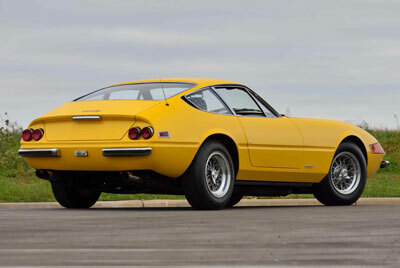 Production started in late 1971 and ran for 500 units through the beginning of 1973 on the same assembly lines as the 365 GTB/4 "Daytona" and 246 GT "Dino". 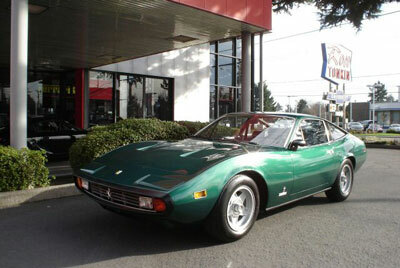 Ferrari offered 48 different factory paint colors in 1971-1973. These colors were available on all Ferrari models at that time. 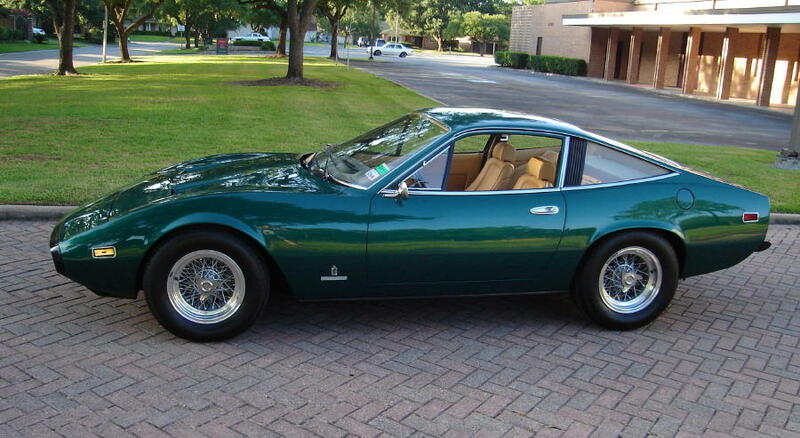 It is unknown how many were actually used on 365 GTC/4 models. Of the 500 produced, only 41 where built with right-hand drive: 6 for Australia, 1 for Singapore, and 34 for the UK market. 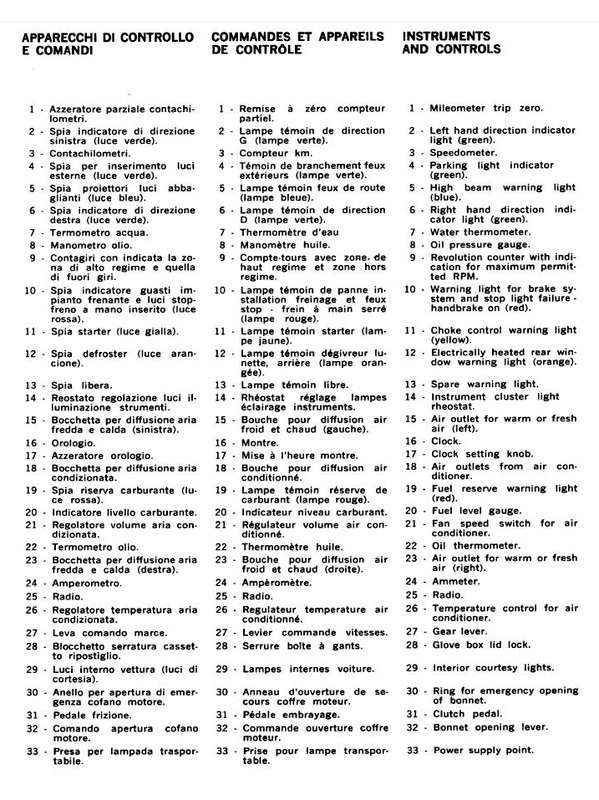 The 194 US Models have different exhaust, ignition, air cleaners, side marker lights, and emission controls than models built for other countries. 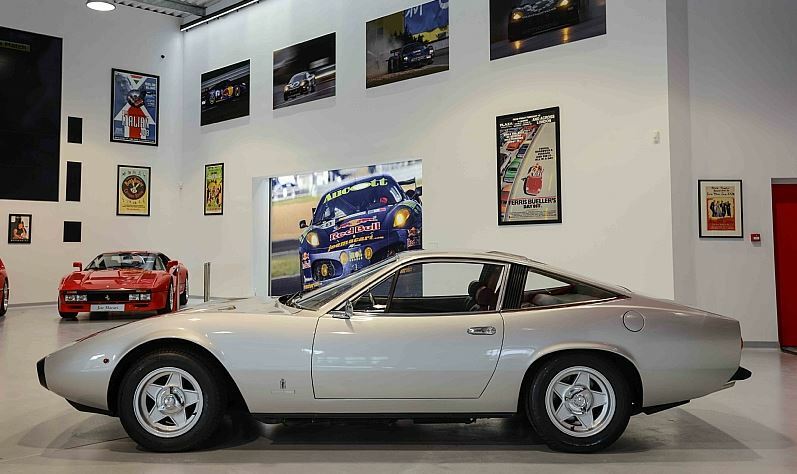 From a conceptual point of view, the 365 GTC/4 shares the wedge shape of the Daytona, with a long hood and a raked windshield that flows gracefully across the roof before descending across the rear window to the short Kamm tail. 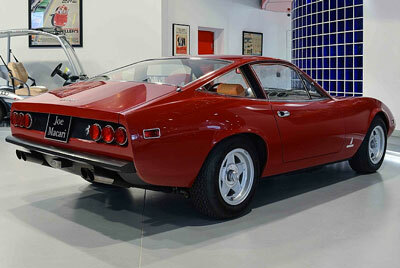 From the sides, the lines are extremely clean, elegant, and flowing. 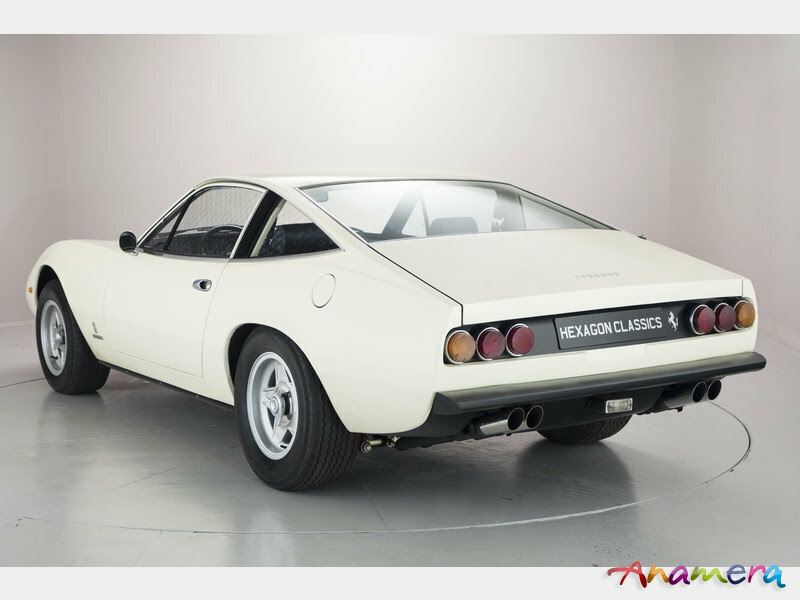 The 365 GTC/4 is a much lower and more exotic looking car than the boxy GT4 2+2s that replaced it, and is more angular and modern looking than the 365 GTC or 365 GT 2+2 models that preceded it. 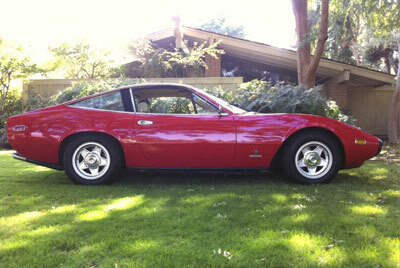 The side profile is low and graceful, without the need for excessive scoops and ducts. 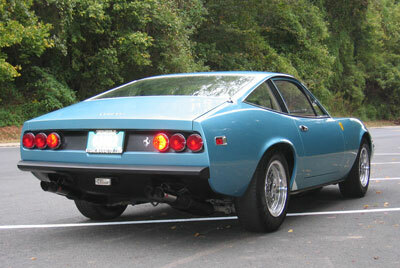 The rear three-quarter view of a GTC/4 exudes restrained power and early seventies Pininfarina style. 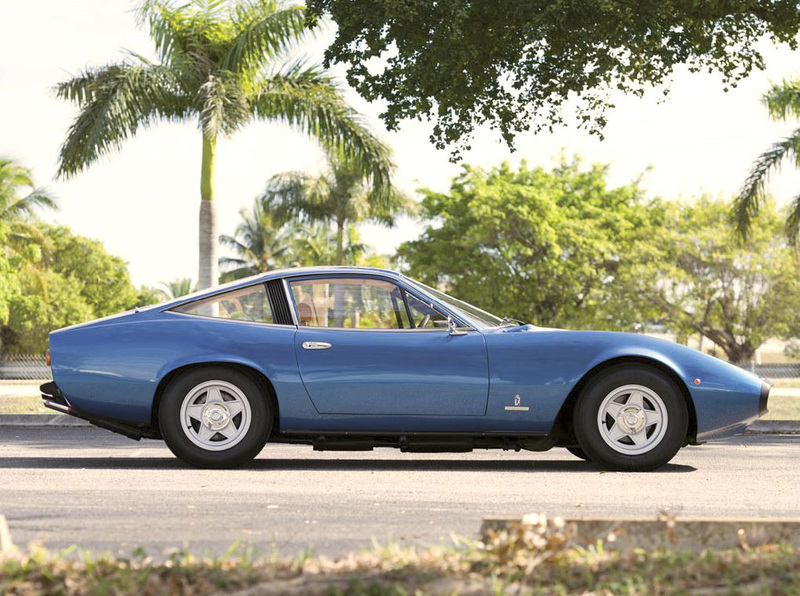 Introduced in 1968 and designed by Leonardo Fioravanti at Pininfarina, the 365 GTB/4 "Daytona" was assembled on the same lines at Ferrari as the 365 GTC/4. 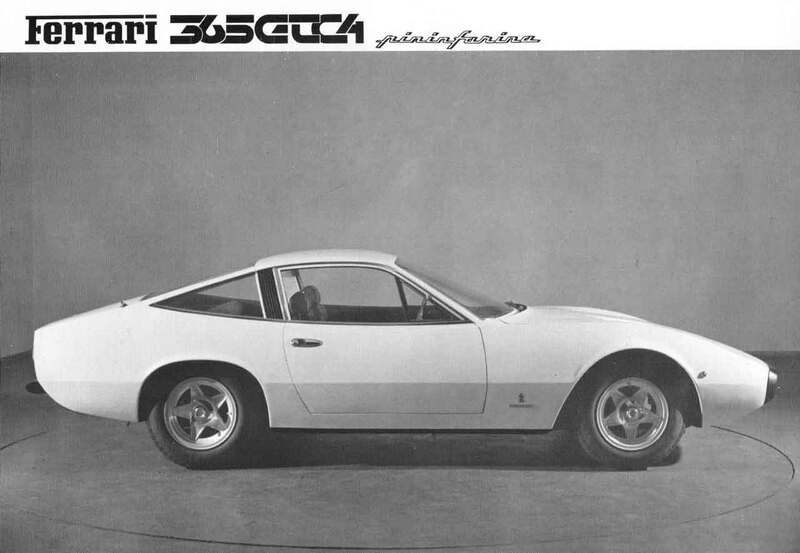 1,406 were produced. 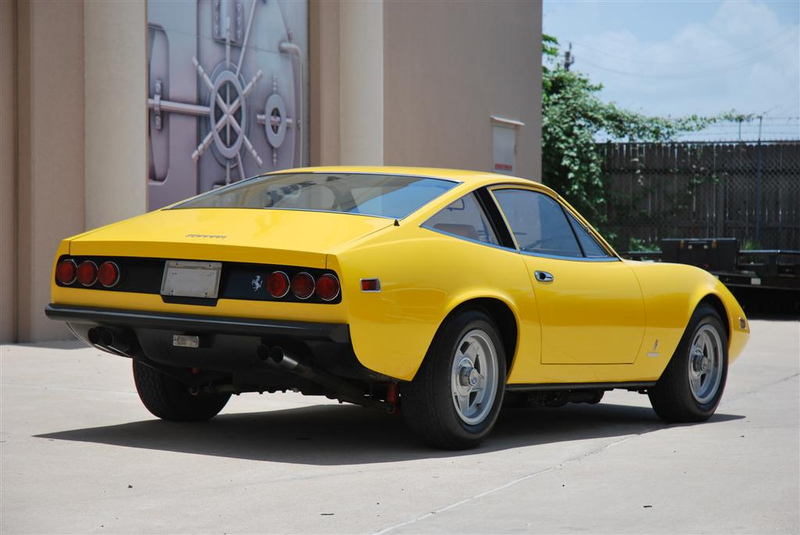 The first Ferrari to have rubber bumpers, 365 GTC/4 s/n 15817 in Giallo Fly. 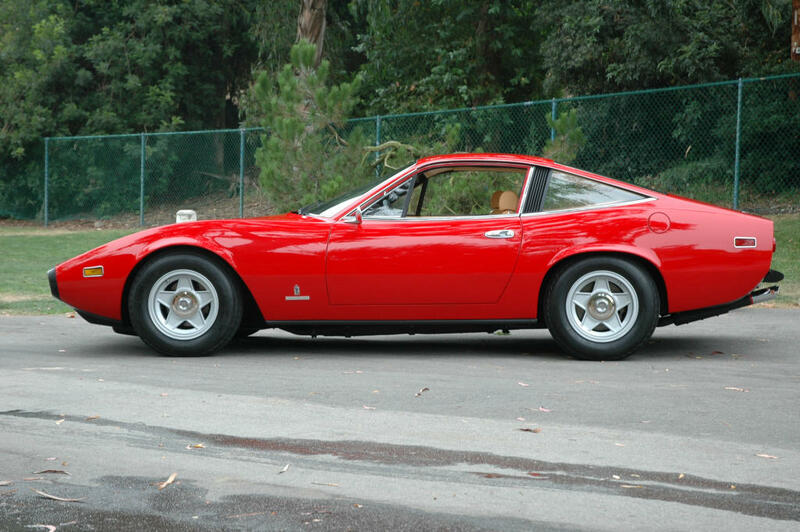 The Daytona and Dino were the last Ferrari cars to have chrome bumpers. 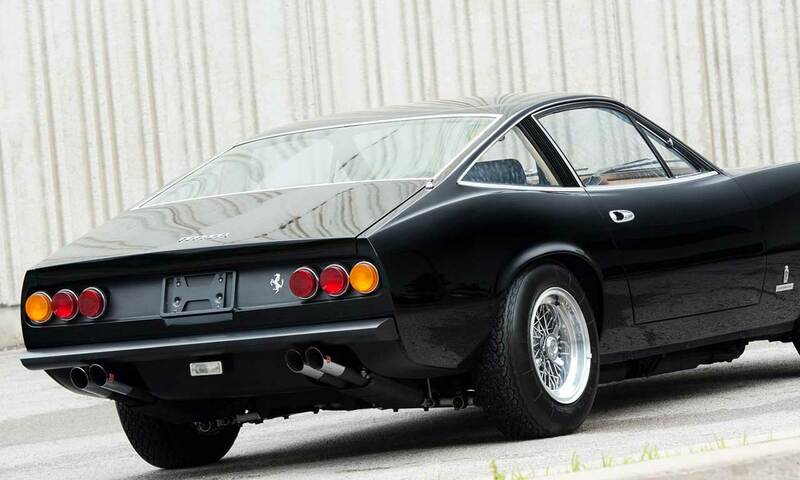 Introduced in 1968 and designed by Leonardo Fioravanti of Pininfarina, the 246 GT Dino was designed and built by Ferrari but marketed as a Dino. 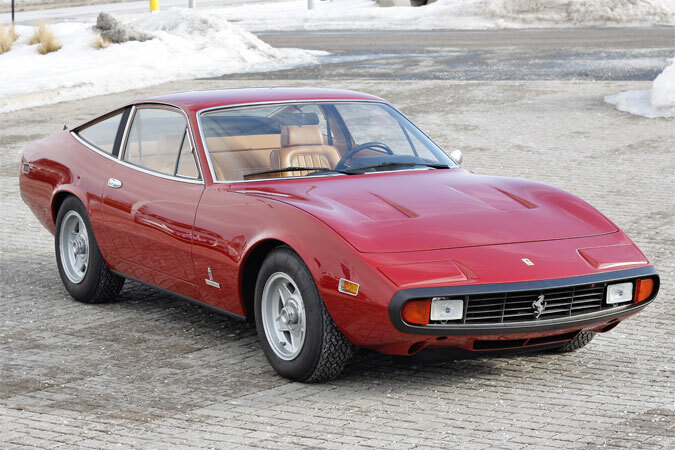 It was the first mass-produced car from Ferrari, with 3,761 built. 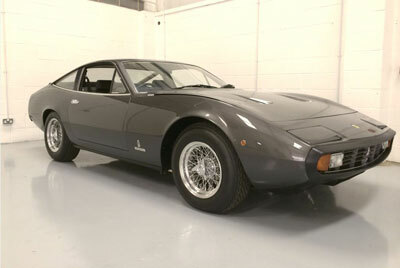 A number of interesting features were incorporated in the design for the GTC/4 and its lines become more and more attractive the closer they are studied. 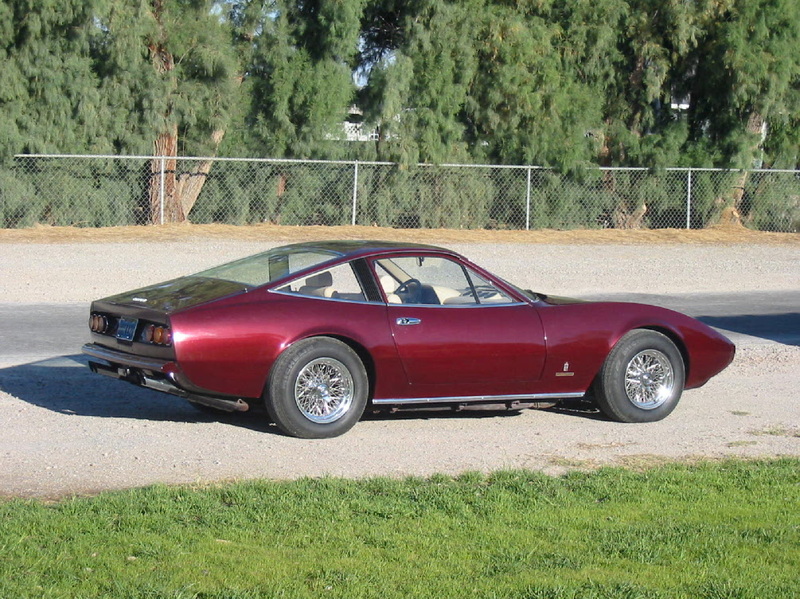 Most immediately apparent is the distinctive matte black synthetic resin noseband that replaced traditional chrome bumper trim for the front of the car, a detail unique to this model. 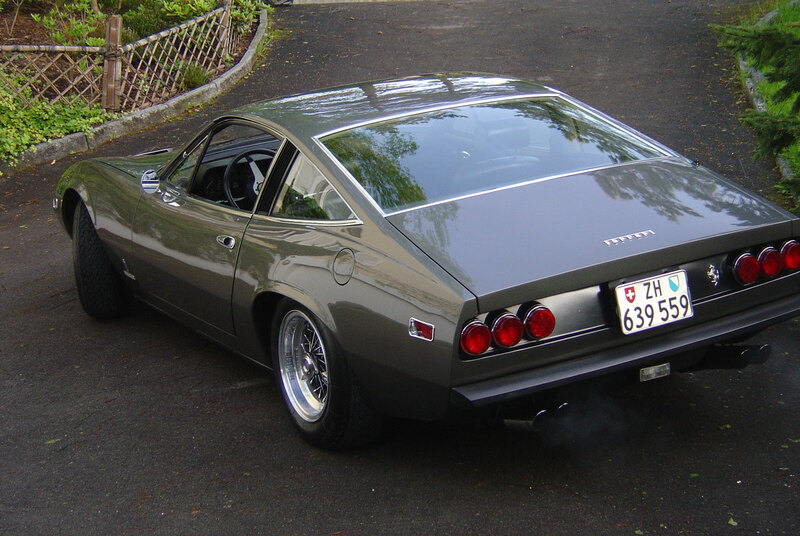 Indeed, matte black was also used for the rear bumper and tail-light panel. 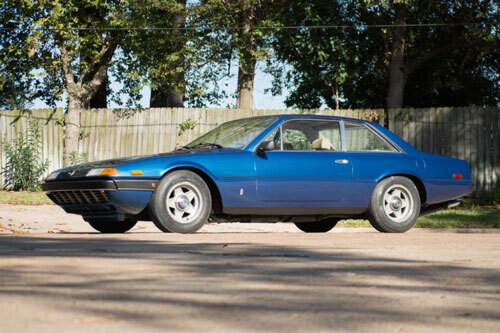 Both features contributed to the refreshing lack of chrome and this cars cleanliness of line, a practice initially begun on the Daytona. 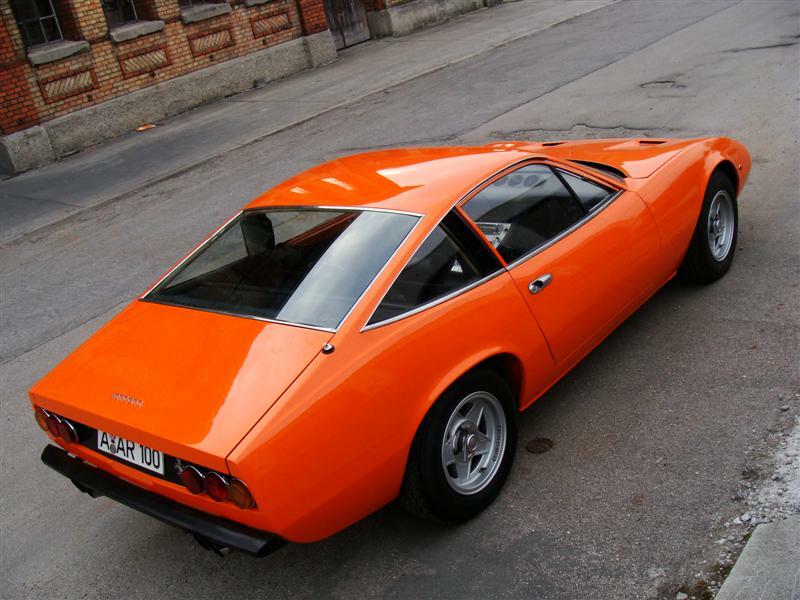 While the black bumpers did not meet universal approval, they are quite tasteful compared to the huge units applied to the Lamborghinis of the time. 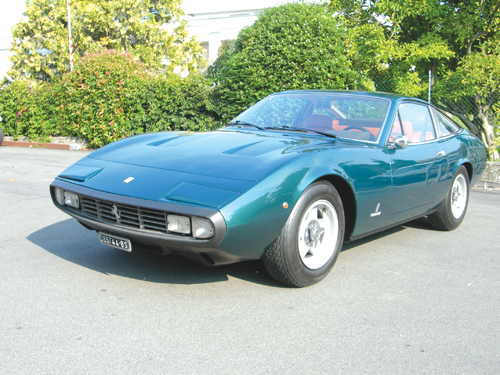 Two other details worthy of mention were the extremely low bonnet with its retractable headlights and that Kamm tail featuring the de-rigueur round Ferrari tail lights, six in number. 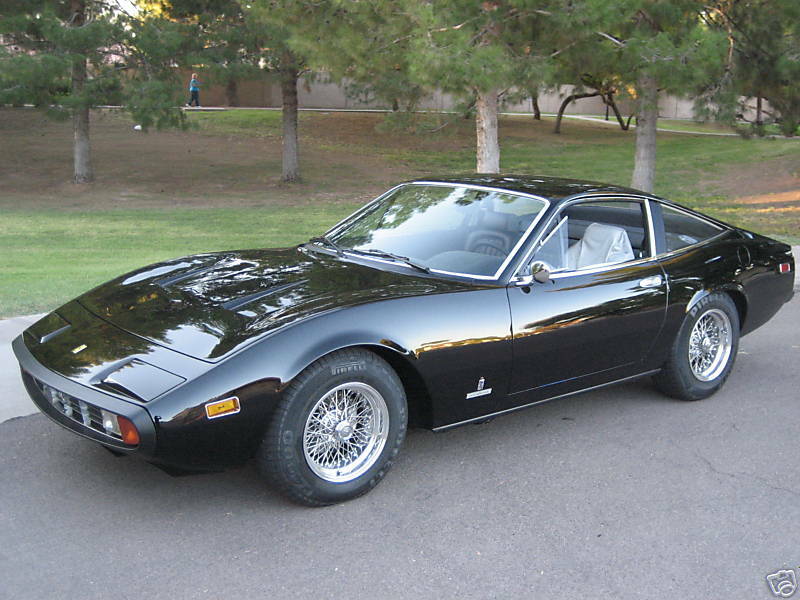 Imitation being the sincerest form of flattery, the 365 GTC/4 received kudos from Chevrolet when they copied the matte black ribbed B-pillar trim and narrow triangular quarter window in their 1975 Chevy Monza. 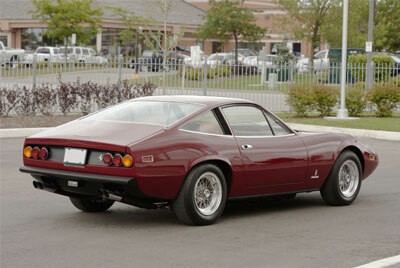 Lacking the graceful slant of the Ferrari, the Monza's implementation was not particularly successful. Often a step behind Ferrari, Lamborghini also adopted a version of the 365 GTC/4's ribbed quarter window trim and black bumpers in their 1973 Urraco, again without the grace of Pininfarina's design. 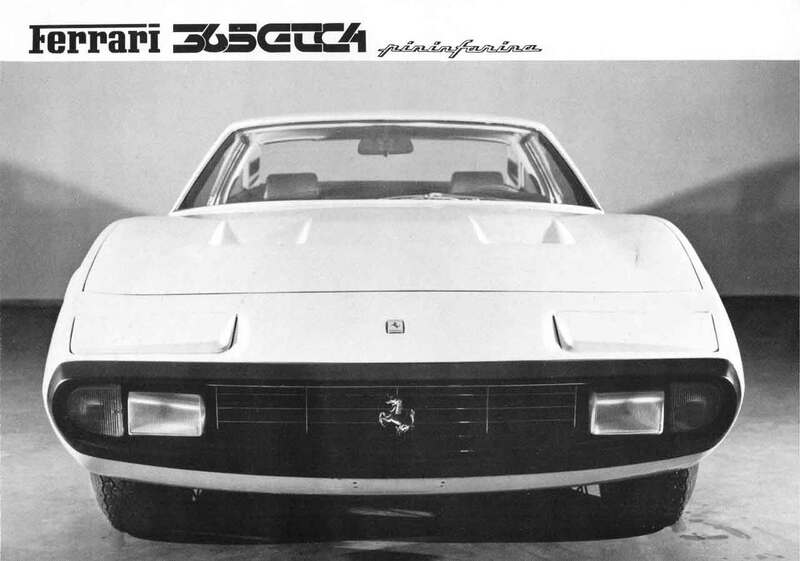 Photos from Ferrari Sales Brochure 55/71. 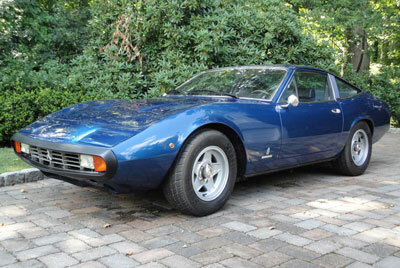 Note that prototype model has different lower front valance, lacking both radiator and brake cooling ducts that appeared by time of production. Ferrari offered 48 different factory paint colors in the years that the 365 GTC/4 was produced. 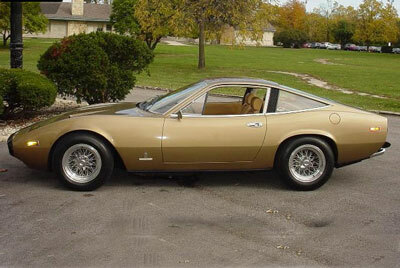 These colors were available on all Ferrari models at that time: the 365 GTC/4, 365 GTB/4, and Dino 246. 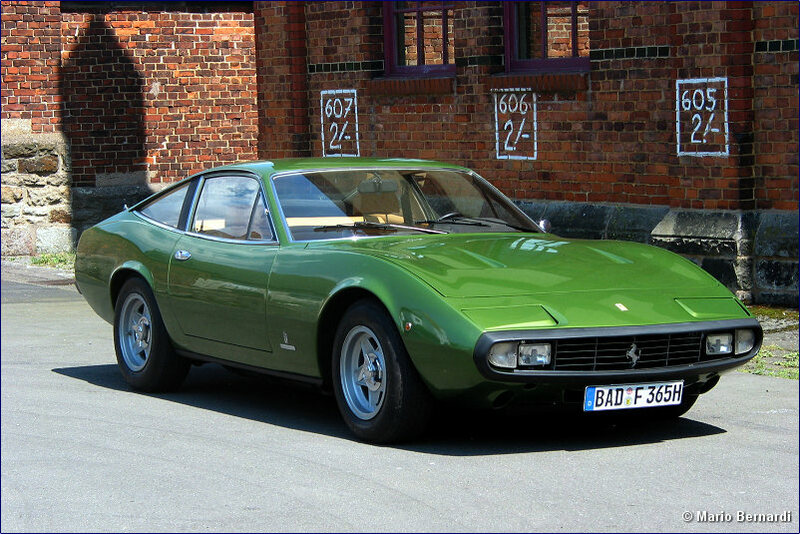 It is unknown how many of these colors were actually used on 365 GTC/4 models. 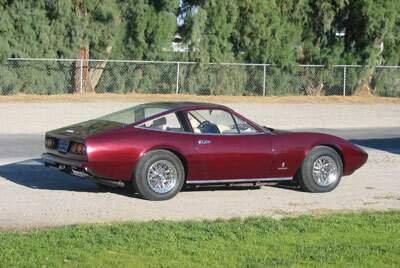 In addition, Ferrari would allow any special order paint color a well-heeled buyer desired. Regardless of exterior paint color, all 365 GTC/4s received a matte-black tail light panel treatment. 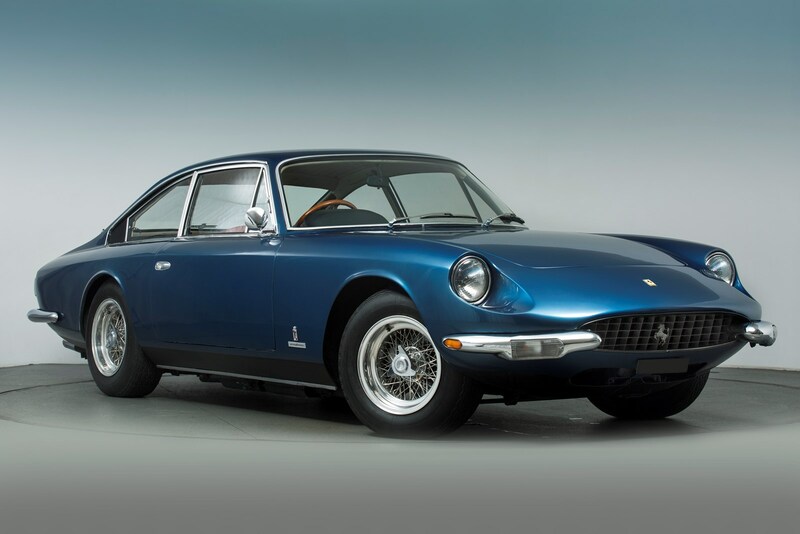 For a full list of paint color codes available from Ferrari in this era, visit the 330 GT Registry's Paint Chip Page. 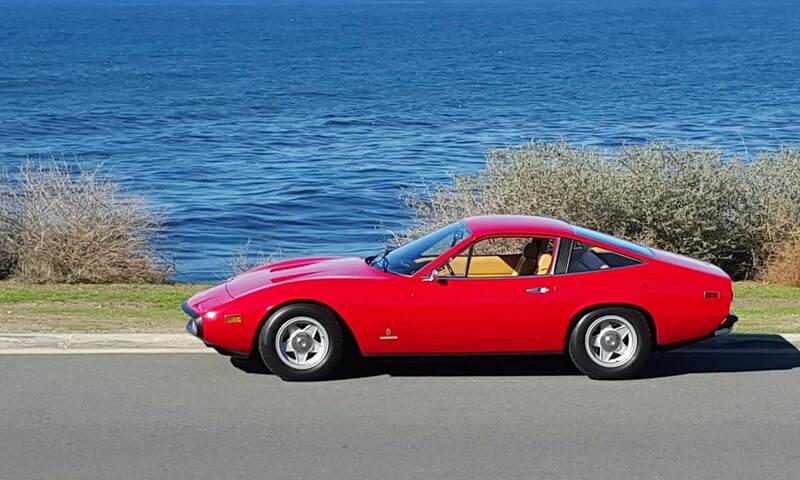 That page has pictures of the Italver, PPG, Scaglietti and Max Meyer paint chip wheels from various years that used some of the same colors. 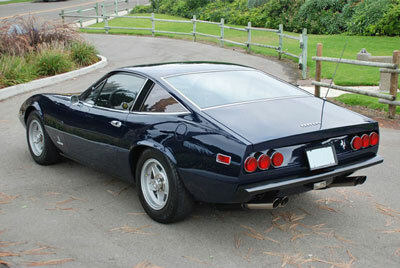 As with so many Ferrari today, the most popular 365 GTC/4 paint colors seem to be the various shades of blue and red. 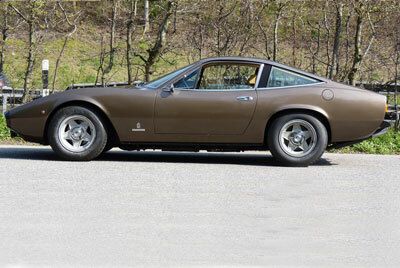 However, in keeping with the model's mature and understated nature, Marrone Colorado (brown metallic) was one of the most popular shades when the cars were originally produced. 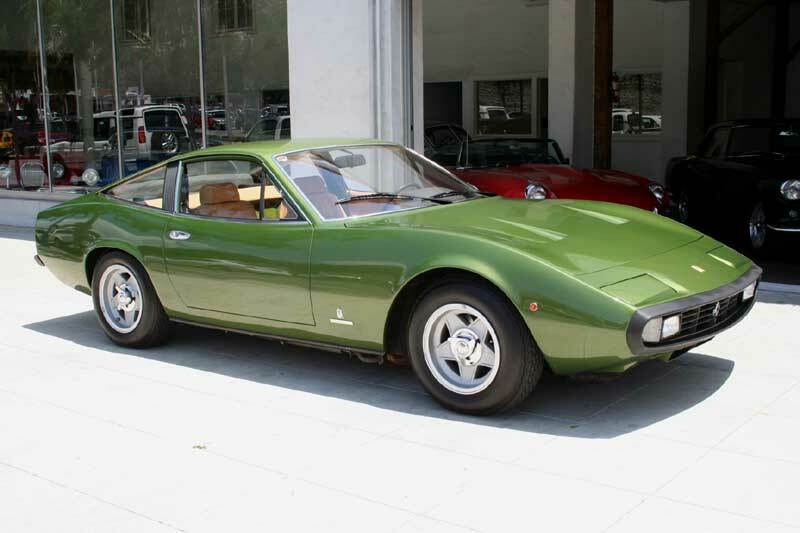 Even today the following cars can still be found in that color: 14499, 14625, 14681, 14959, 15357, 15361, 15505, 15543, 15613, 15693, 15647, 16077, and 16273. 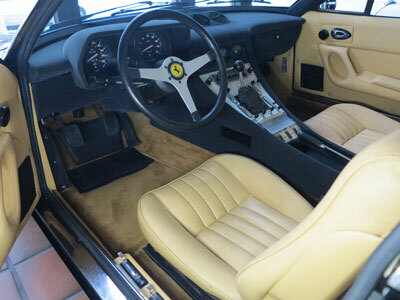 The 365 GTC/4 cabin was to a completely new design and featured an instrument binnacle that was now becoming ever more integrated into the central console in a move that was to suggest the style for years to come. 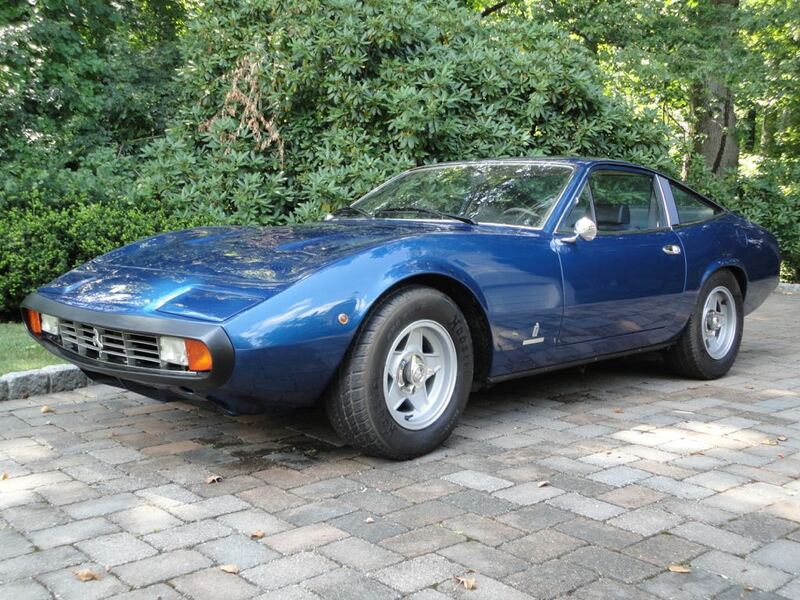 Overall, the interior was more comfortable and refined than that of the Daytona and offered a good deal more luggage room plus two small seats although these were best folded down for additional storage space. 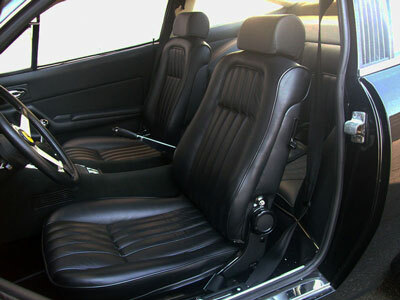 Indeed, this cabin allocated rear occupants with a much smaller degree of legroom than previous 2+2 models, a factor attributable to its drastically reduced wheelbase. Air conditioning was fitted as standard but so were cloth seat centers with leather bolsters, a full Connolly leather interior being optional. 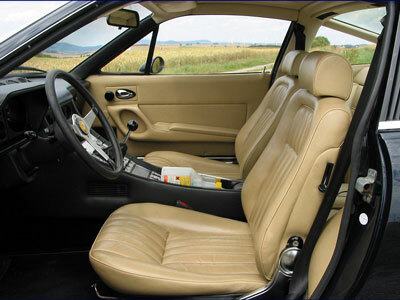 Technically a 4-seater, the two small seats are best folded down for additional storage space. 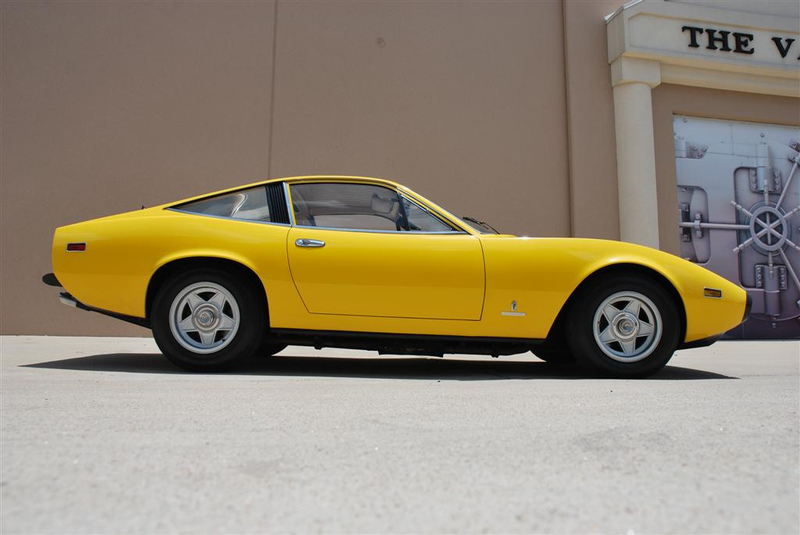 Euro cars have speedometers that read to 300 kilometers per hour while US models have a maximum indicated speed of 180 miles per hour. Both a bit optimistic given a real top speed of 262 kph (163 mph). There were 10 interior color choices: 2 beiges (tans), 2 blues, 2 reds, black, white, grey, and orange. 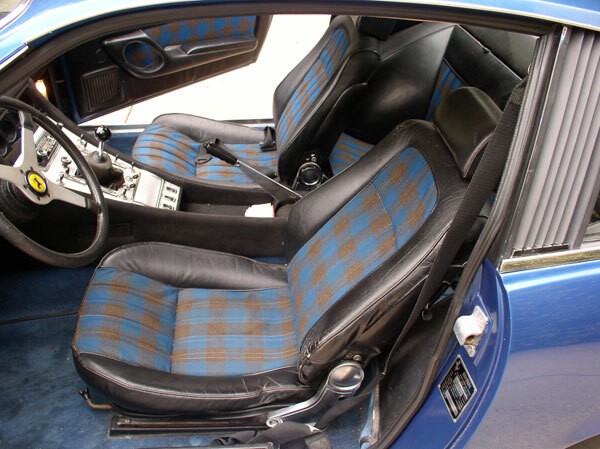 These could be all leather or combined with plaid cloth seat inserts. 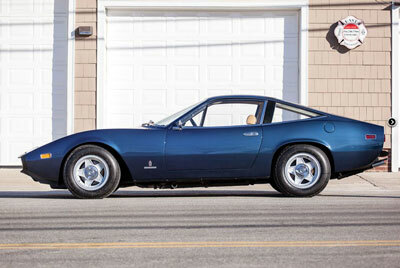 All 365 GTC/4s have a cable-driven tachometer with a maximum indicated engine speed of 8,000 rpm and a 7,000 redline. 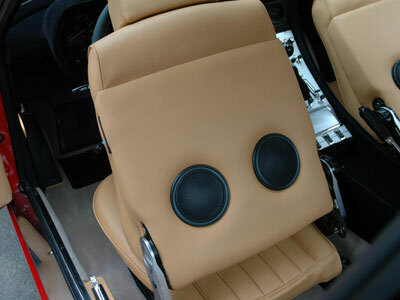 People often mistake the two round vents on the back of each front seat as speakers. They are vents. 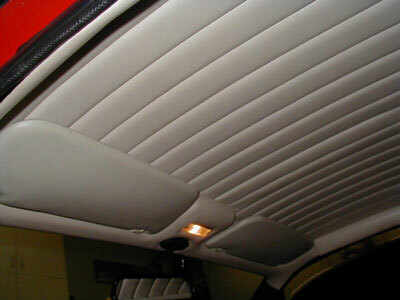 The only speakers are located at the lower front of each door panel. 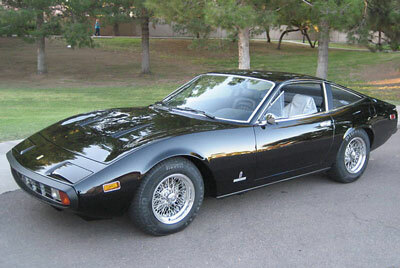 Both the vent trim rings and the speaker grills were made from black plastic and have a tendency to crack. 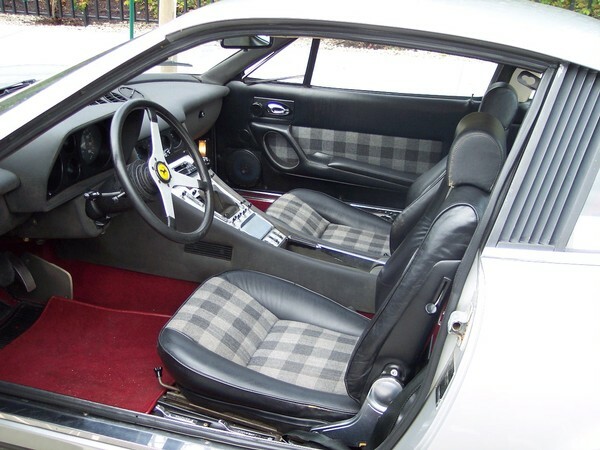 An owner in Australia once remanufactured the vent trim rings and another owner has made replacement speaker grills out of more durable aluminum. The speakers are powered by a Becker "Mexico" model radio with cassette deck and external amplifier located behind the radio under the dash. This was a state-of-the-art radio in its day. The antenna is a powered unit located on the right-rear quarter panel and operated automatically when the radio and key are on. 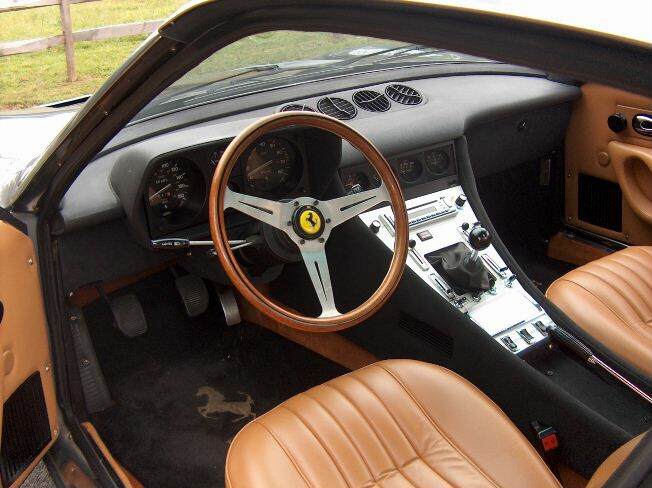 Instrumentation is complete, as befits a Ferrari sports car. 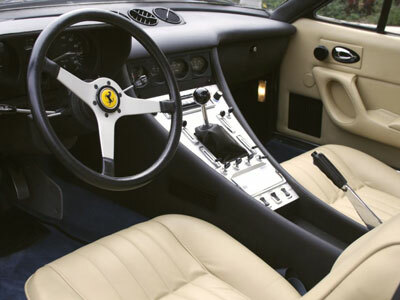 In the driver's side binnacle is the speedometer, odometer, trip meter, oil pressure gauge, coolant temperature gauge, and tachometer. Turn signal indicators (separate left and right) and warning lights for headlights (green), and high beams (blue) are located in the speedometer cluster. The oil pressure and temperature gauges have their own (red) warning lights while the tach contains warning lights for brakes (red), choke (yellow), and rear window defroster (orange). 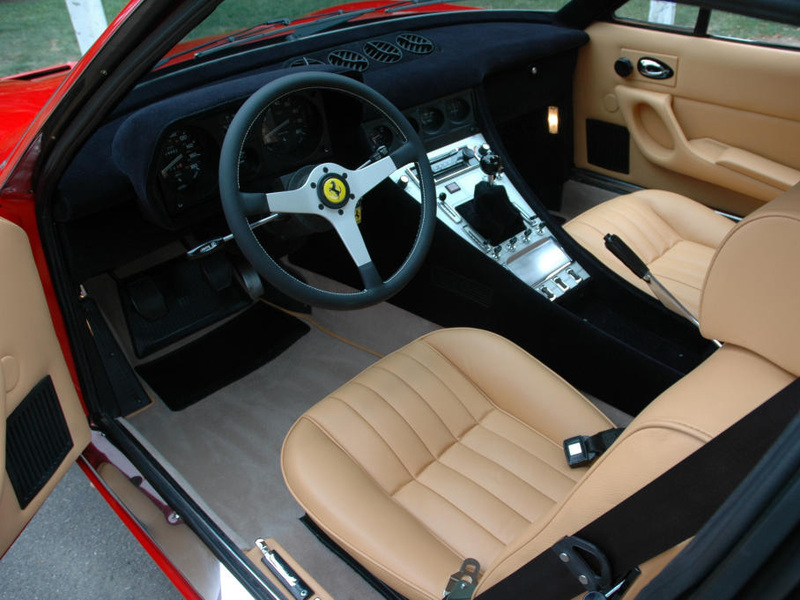 Above the console are four gauges: clock, fuel, oil temperature, and ammeter. Again the fuel, oil temp, and amp gauges have their own warning lights. The clock is analog and set by pulling and rotating a small knob. 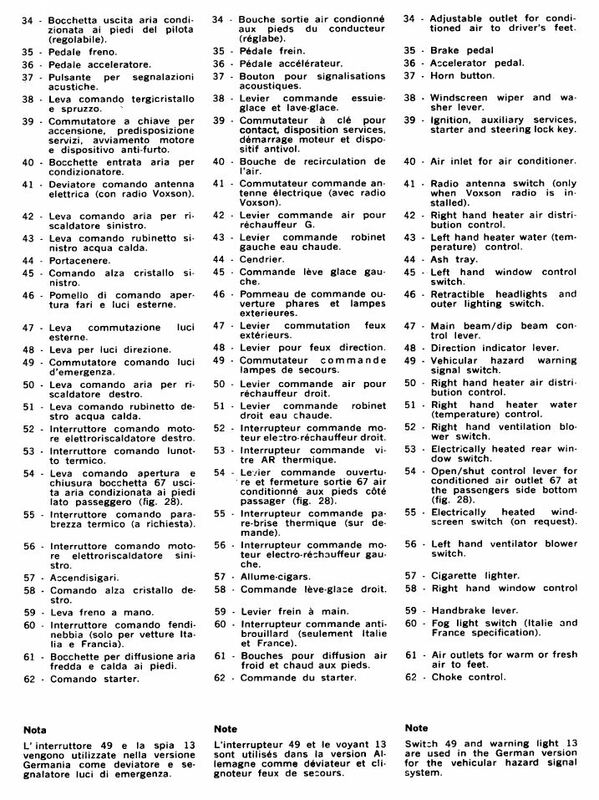 All gauges are from Veglia [Borletti], an Italian supplier eventually purchased by Magneti Marelli. 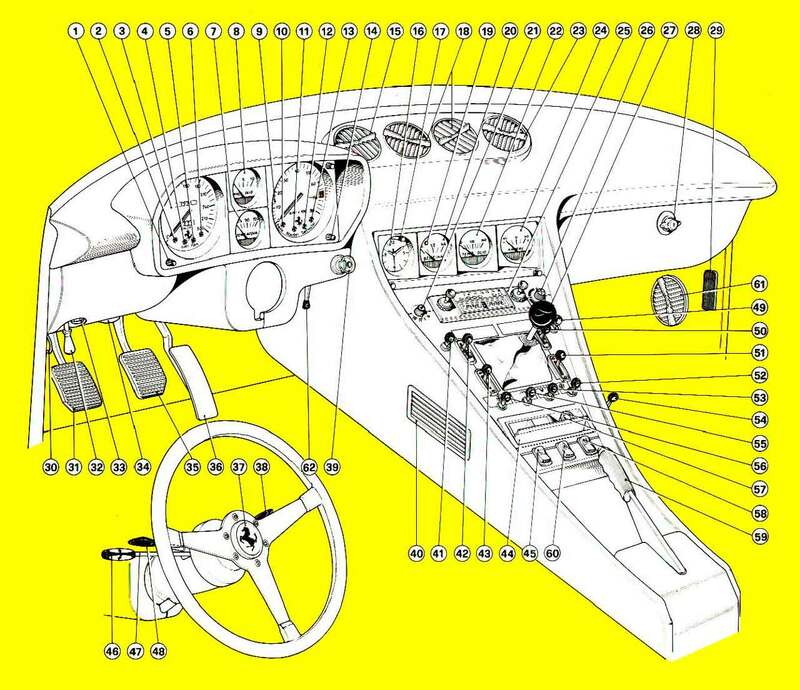 Door glass is raised/lowered by electrical motors operating a complex cable system in the doors and actuated by switches located above the ashtray in the center console. Vent windows open and close manually via rotation of round knobs on each door, a much more reliable system than the latches glued to the vent glass on Daytonas. 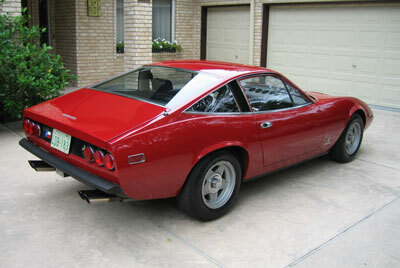 Rear quarter windows are fixed. 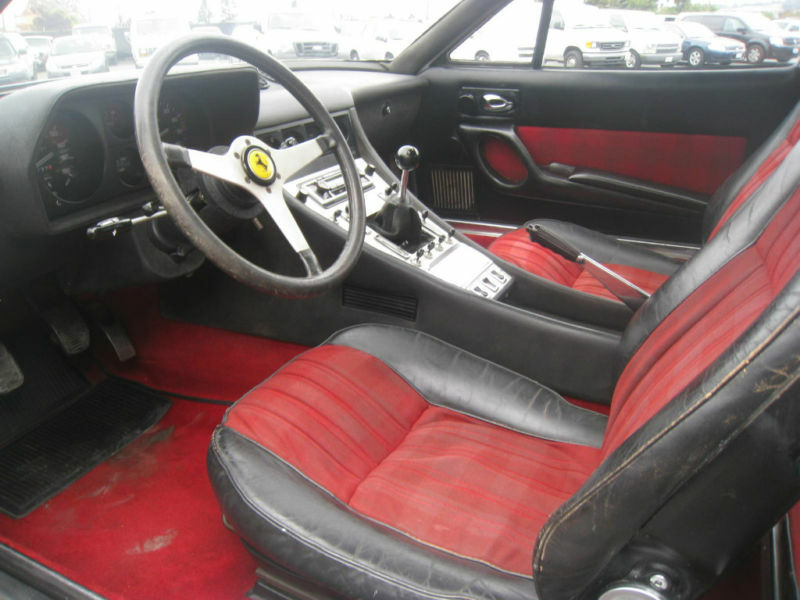 The rear window has thin defroster wires embedded in the glass, operated by a rocker switch in the console. All 365 GTC/4s had a dash, console, shift boot, and rear package tray covered in "mouse hair", a black/gray fuzzy synthetic suede material with a grain. 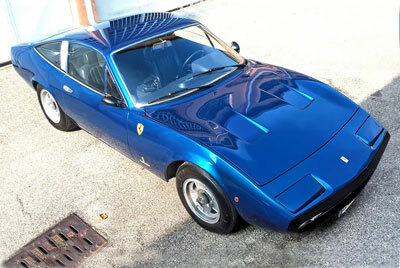 The same material was used on the Daytona and Dino models of the era as well. Over time mouse hair tended to lose its fuzziness and fade to a light gray color. Reproduction mouse hair is available at more than $200/meter. Ferrari offered 10 different leather colors for the interior on 365 GTC/4 models. 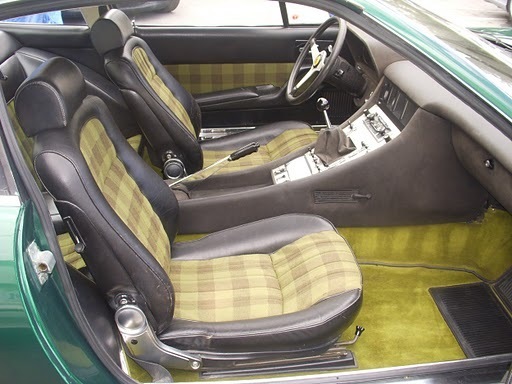 Plaid cloth upholstery inserts were standard on the seats and door panels, a feature unique to the 365 GTC/4 model. Full leather upholstery was a popular option. 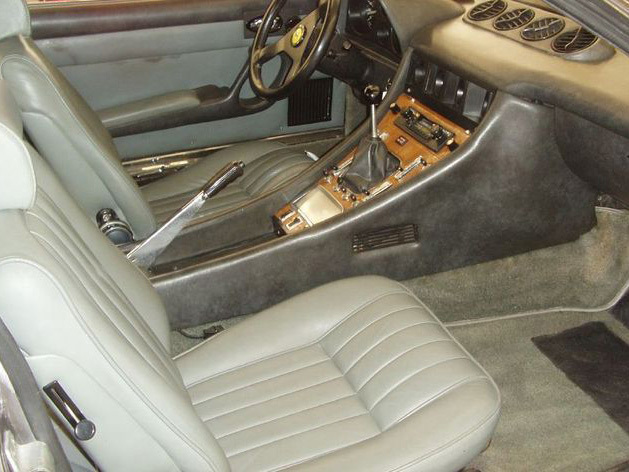 The carpet was piped in leather and rubber foot mats were sewn into the carpet on both driver and passenger sides. 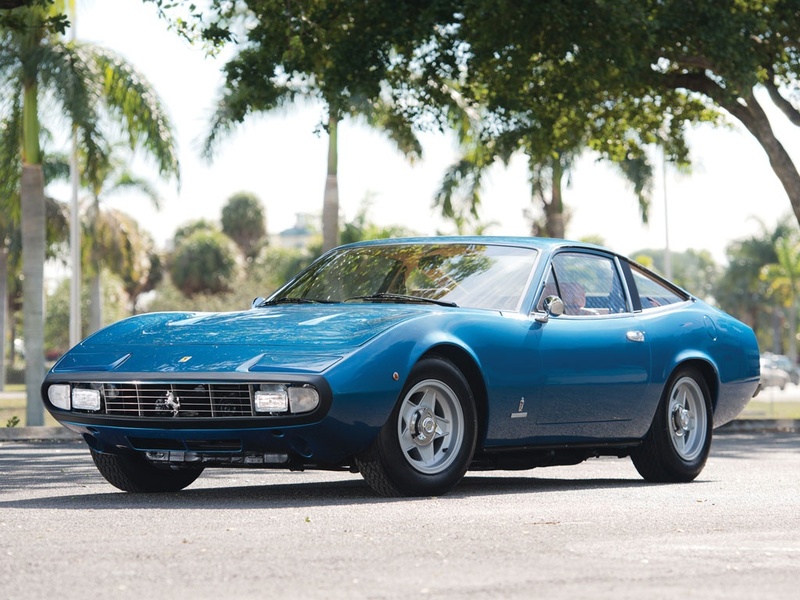 Visit the 330 GT Registry's Leather Page for images of some of the leather colors available from Ferrari during the 60s and early 70s. 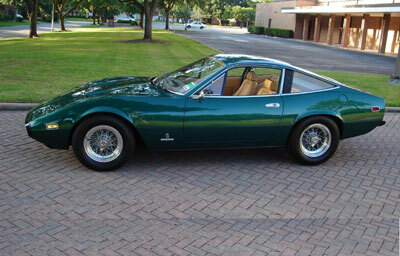 Regardless of interior color, all 365 GTC/4s had a white pleated vinyl headliner and sun visors. These tend to hold up very well unless the car was owned by a smoker. Interior lighting is provided by three rectangular lights, one on each kick panel and one in the front center of the roof. The roof light is a neatly engineered rocker switch with three positions, on/off/door, selected by "rocking" the lens itself into three different positions. 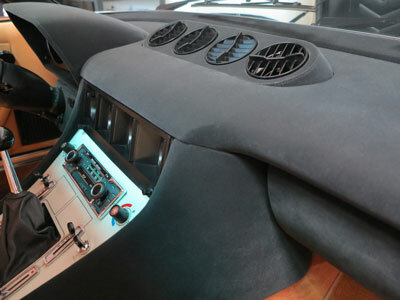 The four vents (center two for A/C, outer two for heat/vent) located atop the dash are similarly clever. Each round vent has angled slats and can be rotated 360 degrees to direct air towards the windscreen for defrosting or towards the occupants, or both, as desired. Contrary to the press photo show below, all production 365 GTC/4s were equipped with a leather-wrapped aluminum steering wheel, not the older-style wooden wheel pictured. 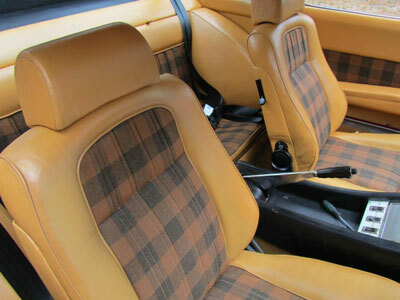 In fact, unlike contemporary cars such as the BMW 3.0CS coupes, there was no wood anywhere (except the trunk floor carpet panel). 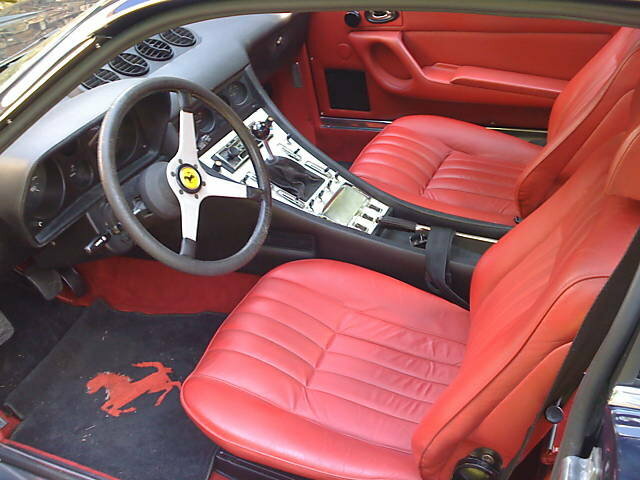 The radio and shift knob shown below are also not consistent with production model equipment. 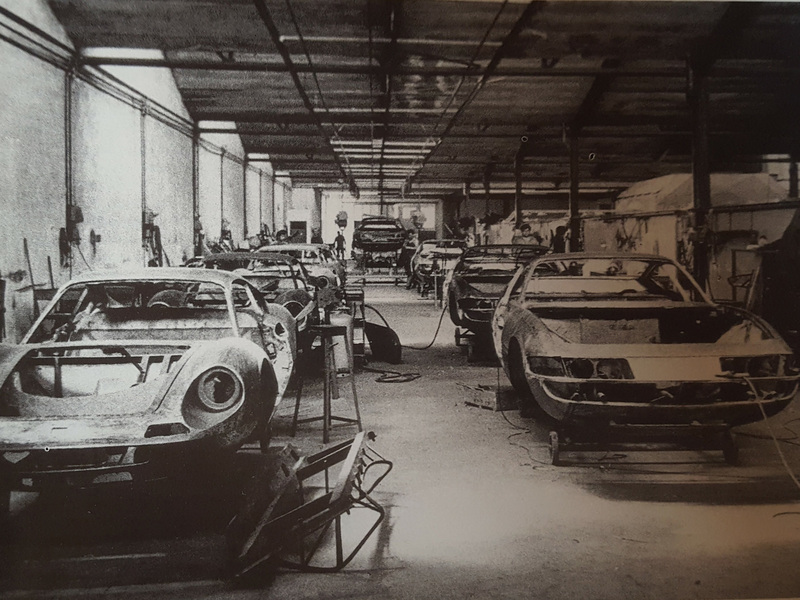 Photo from Ferrari Sales Brochure 55/71.